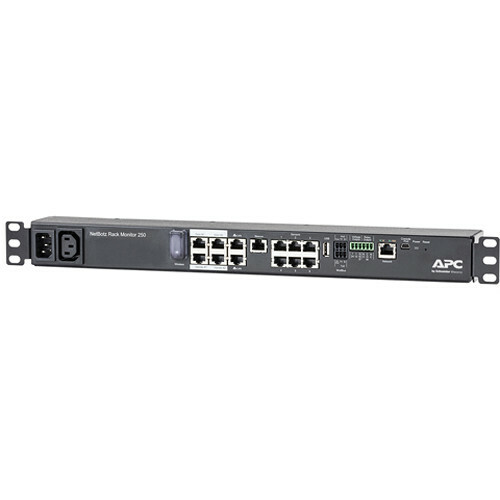 The APC NetBotz Rack Monitor 250 is a control system for your networking systems and NetBotz pods. The NetBotz Rack Monitor 250 connects to the network via RJ45 or serial and supports up to six camera pods as well as six external sensor pods. Once connected, it can alert you to changes in the environment, such as temperature, humidity, fluid leaks, smoke, and others. Box Dimensions (LxWxH) 18.0 x 9.0 x 3.0"
NetBotz Rack Monitor 250 is rated 4.8 out of 5 by 5. Rated 5 out of 5 by MT2020 from A great addition to your environment! I've had customer that have experienced critical overheating issues within their server environment. Installed NetBotz and have had no issues since then becasuse they KNOW what their environmental conditions are. I recommend them to everyone! Rated 5 out of 5 by osudk99090 from Great addition! I've had customer that have experienced critical overheating issues within their server environment. Installed NetBotz and have had no issues since then becasuse they KNOW what their environmental conditions are. I recommend them to everyone! Rated 4 out of 5 by kjm119 from great Had a customer need a rack monitor and so I recommended them check into APC. Fit perfectly in there set up and definitely exceeded expectations. Durable and reliable just like all APC products. Rated 5 out of 5 by bennyboy from Solid, Cost effective monitor! We've had customers rave about these monitors since they know what's going on within their data centers. Anything happening and these will detect it. Highly recommended! Rated 5 out of 5 by RonSwan from Love the features! Installed this about two weeks ago. So glad I did!